Let’s start with the more common casual Thanksgiving celebration. You or your family might traditionally wear, say, jeans and a t-shirt – basically, something not very inspiring. Raise the bar by swapping out your ho-hum casualwear for something a little bit spiffier. 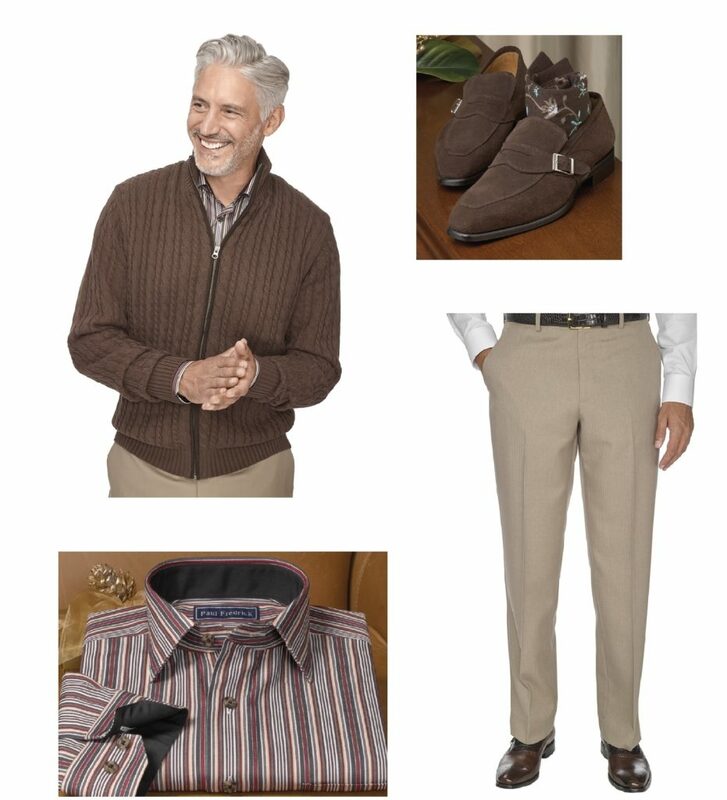 Our brand new Microfiber Comfort-Waist Herringbone Pants are perfect for this occasion. They’re made from 100% microfiber fabric, which means they’re designed specifically for comfort and performance. But their greatest quality by far is a flexible waistband that expands up to 1½”, providing you with all day comfort in addition to casual good looks. That means no meal (not even Thanksgiving dinner!) is a match for these pants. A cotton sport shirt in a seasonal shade and pattern is an excellent complement, especially paired with a mid-weight cotton cable sweater layered on top for extra warmth. For your shoes, skip the sneakers! Loafers will be a more sophisticated choice for this look. Of course, some people do choose to dress up for their Thanksgiving meal. You might be dining at a fancy restaurant or you’ve been invited to a party that requires a specific dress code. In any case, you should first pick out a suit or the slightly less formal sport coat. We’d recommend a solid color or a pattern that is timely yet not too festive: conventional wisdom says one should wait until at least after Thanksgiving to put up one’s holiday decorations, and we think the same concept can be applied to one’s outfits. So just for tonight, bypass the tartan plaids and velvet; you’ll get the chance to show them off soon enough! We like this windowpane example, though a number of different patterns or the always appropriate solid would work as well. Pick a dress shirt for your base – white is fine, but we like a color to add a little more interest to the look. 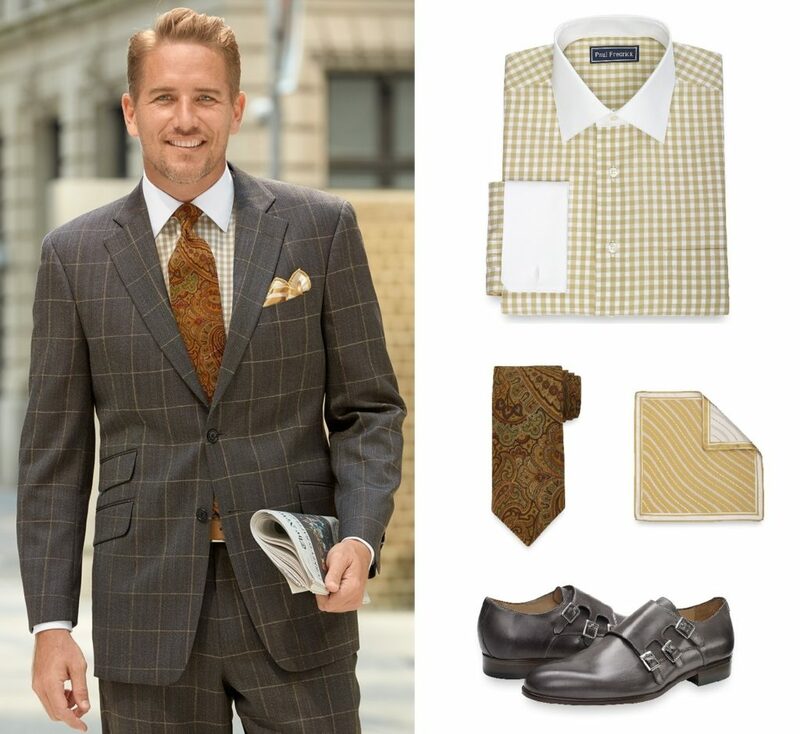 Your tie should bear some sort of relation to the shirt or to the suit (or sport coat), and it’s important to pay attention to the scale of the patterns you are trying to match. Shoes can be oxfords or monk-straps in a color that matches or is complementary to your outfit. We hope we’ve inspired you to up the ante on your style, particularly for a Thanksgiving meal with your family and friends. When you see how impressed everyone is with your new look, we guarantee you’ll wonder why you didn’t do it sooner!